Long story short, what other movies have featured the w116? I know of one other American movie which takes place in Europe, with Robert Deniro, in which w116's (a bunch of them), chase Deniro and his group, who are driving an s420 or some other mid-90's s-class through the narrow and winding streets of Italy. Deniro's group are after a suitcase. That's about all I remember. Well i cant think of any movies right at the moment, but I'm sure the other guys can cos I think there was a similar thread way back. But for any freaks like me that just have to watch "Home and Away" (i'm not sure how many other countries get this show) to see what happens next, (yes thats the reason... ) I saw a blue w116 in an episode not long ago, being driven by a drug dealer, who mysteriously dropped off his package, then drove off down the road. The one with Robert De Niro's group after a case is called "RONIN", its a 6.9, A bond movie that has a 116 in it is "for your eyes only" (its not for the squeamish, the meets an untimely demise). 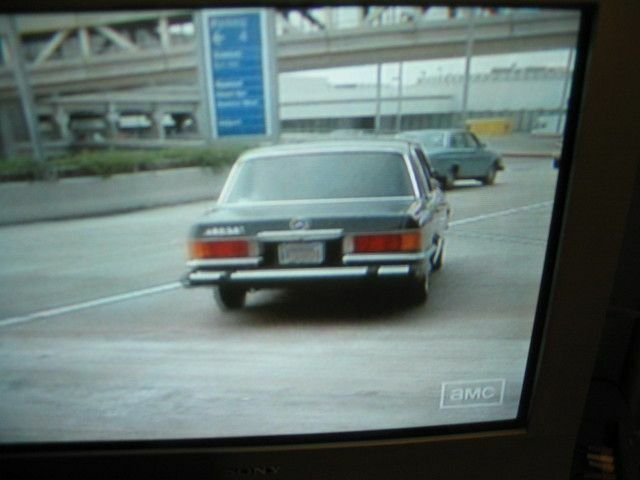 There's a w116 in 'Matrix revolutions' you just get a glimpse but it's there! Here http://www.hampstead.com.au/mb/index.php is a site dedicated to M-B in the movies - and it's owned by a chap in Melbourne. I've written a few reviews for it over the past two years. also in Rocky 4 there was a black 116 with snow chains on it. That's all I can think of off hand. My 450SEL, will be in a film called "Rise of the Footsoldier" which should be out in september. A British ganster film, based on a true story that led to the infamous Range Rover killings. I bought my car from the film company. My opinion is that (after watching the Ronin chase scene perhaps a dozen times) it is NOT smoke and mirrors, but that the only special effect was the background sound (as it is impossible to correctly cut in natural sound during a scene as complicated as a chase). The movements of the car, loading of the suspension and timing of the various smoky burnouts are far too perfectly choreographed to be faked. See Fast and Furious for an idea of how obvious vehicle performance special effects are - even in the most modern movies. The human eye and mind are far too familiar with vehicle dynamics in the natural state to be fooled by camera trickery. Simple physics - just like poolroom scenes - while you might get creative with cuts and timing of which shots to use, ONLY natural shots can replicate the physics of acceleration, braking and loading and unloading of tires and suspension. I'm with you on this. the driving stunts in Ronin, were by Equipe Remy Julienne, who did the original Italian Job. They did without special effects on that one! John H: Good to see you back here! Hope you're here to stay this time. Thanks Sev. Looks like I have some movies to watch this weekend Nothing else matters in a movie as long as there is even a glimpse of a W116! the zodiac has a baby blue 116 in the background! Page created in 0.127 seconds with 21 queries.